With the XXXX Gold Bunbury Cup moving to a Sunday timeslot in 2018, the Bunbury Turf Club is delighted by the result, which validated the shift from the traditional Thursday race meeting. With over 5 000 revellers enjoying Bunbury Cup Day, attendance was up 10% on last year. Bunbury Cup Carnival attracted just over 6 141 spectators in 2018. Over 70% of all attendees at the Bunbury Cup Carnival were visitors to Bunbury. 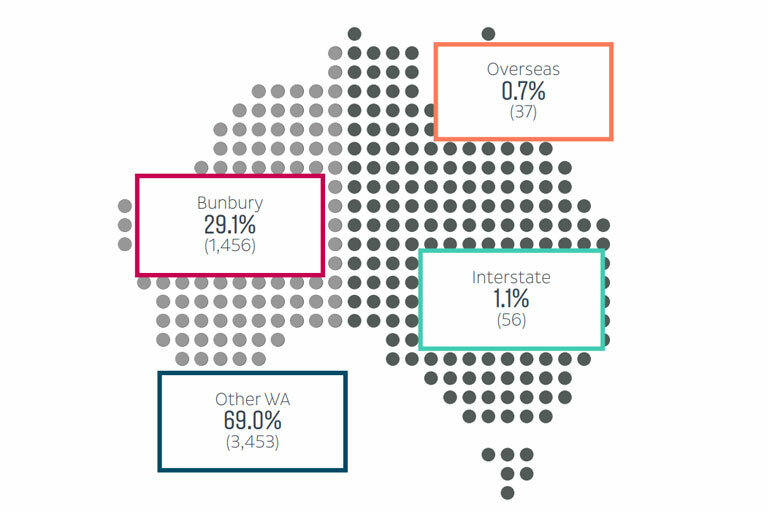 WA residents from outside the Bunbury region made up 69%. 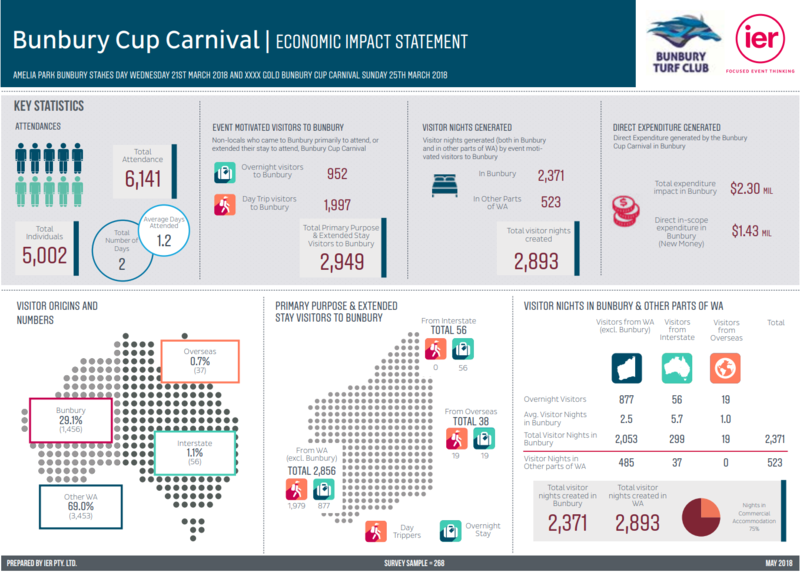 Bunbury Cup Carnival was responsible for bringing 2 949 individuals into the region who otherwise may not have visited. Of these event-motived visitors, 952 stayed at least one night in Bunbury, while the remainder were day trippers. Overall 2 893 visitor nights were created in Western Australia, with Bunbury being the beneficiary of close to 82% of these nights. 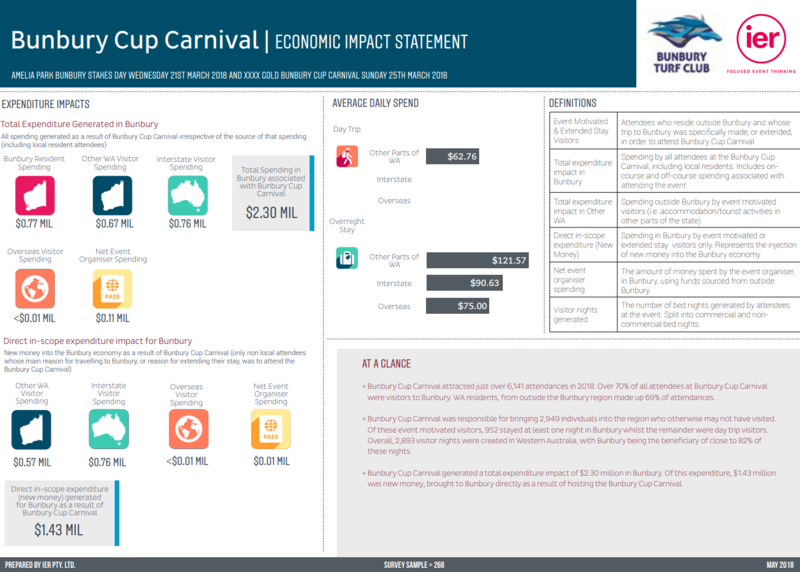 Bunbury Cup Carnival generated a total expenditure impact of $2.30 million in Bunbury. Of this expenditure, $1.43 million was new money, brought to Bunbury directly as a result of hosting the Bunbury Cup Carnival. “Bunbury has a population of 33 000 and what the data shows is that 5% of the local population attended the event. Over the next few years, if we can grow this figure to 15%, we are looking at 8 000 to 10 000 people on Bunbury Cup Day. This is our challenge.” added Doble. Click on the report below to download the full PDF.